We was just driving along the Los Cabos Corridor when we spotted the Latitude 22+. We wasn't intending to eat there when we set off but we saw it and thought, why not? When you're on vacation it's usually the little out the way places that turn out to be real gems. If you like your ribs and steaks then Latitude 22+ will please your pallet. It's located at km 4.5 along the Transpeninsular Highway. From there the restaurant gives you an excellent view of the Sea Of Cortez. There' nothing fancy about this Cabo San Lucas restaurant. The walls are filled with memorabilia, and number plates. It gives this restaurant a lot of character, and adds to its theme. This Cabo restaurant was an afternoon snack for us so we just settled for one course, and a couple of beers. Not wanting to ruin our appetites for later we just went for a couple of Burritos. These were the carne which was prime rib. And we also went for the Camaron which was shrimp. Even they was more filling than we expected so we was glad we didn't decide on a full dinner. We was watching the food as it came out, and rib and steak lovers will like it here. They was coming up at what appeared to be a nice size. 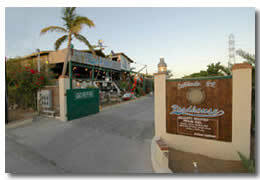 Latitude 22+ has a different atmosphere to any other Cabo San Lucas restaurant we have been in. It's friendly, and the all the things hanging up make it a little rough around the edges. This in no way though should turn you off of the good food. From the outside it just looks like a large shack but inside you know you're going to get a good meal. The restaurants specialty is slow roasted Croatian prime rib. They also have a singer in their, Peter Bacon. He plays the piano and sings on a Thursday, Friday and saturday night. A few people were talking about him in there when we was there but we wasn't in there long enough to view his act. 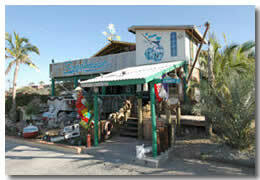 We wasn't let down with this Cabo San Lucas restaurant, and we will be returning to it's friendly atmosphere.